Marketers can now leverage additional email providers for delivery of VisitIQ-enabled links and add marketing automation intelligence to ordinary email. eTrigue has expanded their integrations with additional email service providers for their VisitIQ IQ Link builder. Visit IQ helps marketers to target prospects by tracking site behavior of individual prospects. 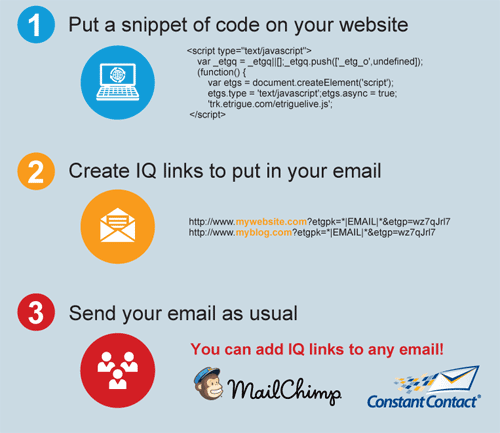 Marketers add VisitIQ-links to email messages that are sent via their own email marketing platforms. If a prospects acts on email newsletter, the VisitIQ marketing automation system automatically ties the prospect’s Web activity to his digital profile. The system works with a website placed code snippet and built urls to be put inside the email as illustrated below. Emails can be automatically triggered to send event driven mails based on specific Web site visitors and their behavior. These Real-Time Lead Alerts can inform a user that their company is top of mind of a particular prospect. VisitIQ tracks page visits, duration on individual pages, document downloads, Google AdWords responses, and webinar attendance for Cisco WebEx and Citrix GoToWebinar. Anonymous Visitor Tracking: Most website traffic is anonymous. VisitIQ identifies companies, geographies, and records every visitor’s individual web activity from their very first visit to your web site. Prospect Activity Tracking: Once a VisitIQ link is clicked in an email, prospect activity tracking lets you listen to your prospect’s actions by monitoring web page views, time on page, webinar participation, Google AdWords clicks, and more. Real-time Lead Alerts deliver a detailed prospect snapshot via email to any user so you’ll know when your company is top-of-mind. Google AdWords and Search Terms: Get insight into which Google AdWords clicks result in qualified leads, opportunities, and new customers. Webinar Marketing: VisitIQ automatically synchronizes registration information and timed attendance data event data with the two most popular webcast providers: Cisco WebEx and Citrix GoToWebinar.